Matt Deighton from Timeless Chesterfields gives his export tips. 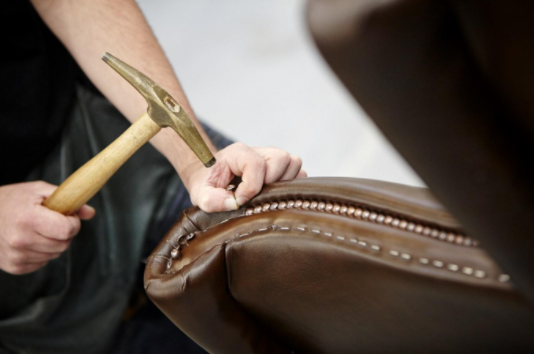 Matt Deighton is the Managing Director of Timeless Chesterfields, a family run company that has been handcrafting and exporting Chesterfield sofas for 30 years. Here he explains how exporting furniture has helped to grow the business and shares his expert advice. Chesterfield sofas are loved by people from all over the world. As a result, at Timeless Chesterfields, we’ve been proudly exporting our handcrafted designs for 30 years. We receive orders from mainland Europe on a weekly basis, and frequently ship our sofas further afield to the likes of the USA. Exporting has been vital to the development of our business. Chesterfield sofas are relatively niche products, so being able to look beyond the UK market has given us a much wider audience to engage with. Additionally, people overseas have a lot of respect for British craftsmanship and we’ve found that our handcrafted furniture is very desirable outside of the UK. Over the years we’ve been able to establish excellent transport links that allow us to deliver our furniture to almost any address worldwide. We work with a number of reliable shipping partners, and this allows us to make quick and hassle-free deliveries at a competitive price. This has helped us to build up trust with our customer base, which has made it possible to develop and grow our business quite successfully. How can your business begin to use the power of exporting? A lot of research must be carried out by a company before it begins to export goods. This is because there’s a whole host of channels you can go down, a variety of companies you can work with, and a long list of rules and regulations you’ll need to abide by. Firstly, you need to decide where you’re willing to export to — and, perhaps more importantly, where there is a demand for your products. We ship our furniture all over the world, but this isn’t your only option. Some companies only deliver within the EU, or to a hand-picked selection of countries. Whichever option you choose, it will determine which laws and guidelines you’ll need to follow. The UK government has an exporting guide that outlines those that you’ll need to think about. You’ll also be required to choose a shipping partner and, before coming to a decision, it’s wise to carry out a number of small tests. This will allow you to check how responsive companies are if problems arise, how reliable they are when it comes to the likes of delivery times, and whether they require much input from you during the shipping process. By testing a number of companies you’ll form an idea of what you can expect from a shipping partner and will be able to choose the one that can meet your requirements. We’ve been exporting our furniture for a number of decades now and we’ve learned a lot along the way. In my opinion, the most important thing is that we’re flexible and willing to change our strategies when necessary. This is vital if you’re working across multiple countries, as a one-size-fits-all approach is unlikely to work. At Timeless Chesterfields, beginning to export our sofas allowed our business to grow dramatically. It’s a move that we’ve benefitted from ever since, and if you know that there’s a demand for your products overseas, I would highly recommend looking into whether this is a feasible option for you too.